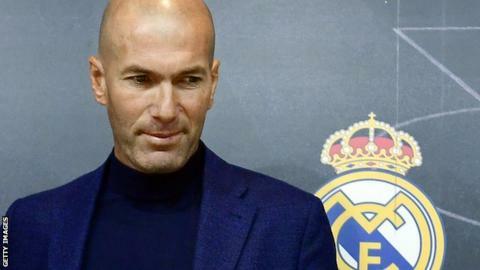 Zinedine Zidane said he is "very happy to be home" after returning as Real Madrid manager just 10 months after leaving the Spanish giants. "The best manager in the world has rejoined the club," Real president Florentino Perez said. "Our destinies are once again united." Solari's last match as manager was a 4-1 win over Real Valladolid on Sunday - which followed a shock Champions League exit to Ajax. The Champions League elimination followed two consecutive losses to Barcelona in El Clasico - a 1-0 reverse in La Liga and a 4-1 aggregate defeat in the Copa del Rey. Four and a half months later it was Real's turn to fire him. "Real Madrid thanks Santiago Solari for his work done and the commitment and loyalty he has shown to what is his home," the club said. Zidane was officially unveiled in a ceremony on Monday and said: "I want to put this club back where it belongs. "It has been difficult from the outside looking in. None of those players have certain futures at Real, with captain Ramos, who has been at Real for 14 years, reportedly falling out with president Perez. Wales forward Bale is expected to leave because of a fractious relationship with the club's fans - who have booed him recently - and players. He will be given all the sporting authority and all the things he suggested in the summer that Florentino Perez did not want to do - most of them will be done now.